All these Book of Angels posts are probably getting old, but according to Mediafire stats, people are downloading them, so lets finish off the series. It's actually funny I didn't get this album last year when I was obsessing over cellist Erik Friedlander's other 2007 album "Block Ice & Propane" (#17 on my top 50 of 2007). Being as that was my first solo Friedlander album, his inventive and warm cello playing definitely made me look into some of his other solo work. My excursion into the Book of Angels series led me to this one, which on a biased note, may also be among my favorites (how many times have I said that so far?). Let's just be honest for a quick second: the cello is one of the most moving and beautiful instruments there is. Plus, my girlfriend is an awesome cello player. Friedlander brings out emotion in his pieces. Block Ice & Propane told his history of family vacations, cinematic in it's beauty and simplicity, bringing to mind striking images of a forgotten America. "Volac" like all the other volumes in this series, is based on Jewish music (though of course written by Zorn, so not necessarily traditional). Though I can't sympathize and bring up my own personal memories with this release that I could with BI&P, that doesn't prevent the release from being just as cinematic and vivid. It still tells a story through music, it's your job as the listener to put it together. It is a wonderful, wonderful set of music and incredible edition to a nearly flawless series (Book of Angels) as well as a welcome addition to an amazing catalogue of one of my recent favorite musicians: Erik Friedlander. Erik Friedlander is one of my favorite musicians, and the cello is one of my top 3 favorite instruments (the other 2 are djembe and flute). John Zorn is one of my favorite composers. 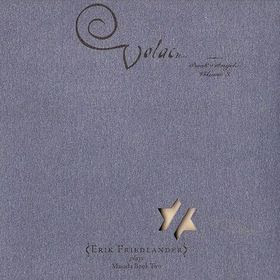 So, all in all, you've done me a great favor by letting me hear Friedlander's "Volac" album. Thank you!